The Eagle spirit is alive and well at American University - and not just among the students! The university counts more than 1,300 faculty and staff members as alumni, and that number increases each and every year. Working for one's alma mater is a unique and special experience that often serves to increase an alum's commitment to and love for the university. To share what makes it so special, we polled a few faculty and staff alumni and asked them this question: What do you love about a faculty or staff alumnus/a? Their answers will make you want to work at AU too! "Teaching at American University has been a full circle experience for me. It allows me to "pay it forward" by creating and fostering a conducive and exciting learning environment that challenges our students - our emerging leaders - to better understand how the lens in which they see the world influences the arsenal of tools at their disposal to find viable solutions to many of the social dilemmas facing our society." "I love having the opportunity to work with so many people who are dedicated to making AU an even better place than it was during my time as a student, and I love helping my fellow alumni reconnect with the institution and reminisce about their time on campus." "Returning to teach at AU after a fulfilling career in journalism was the icing on the cake. AU launched me, and more than 25 years later, let me come back to share what I learned with students. I studied journalism when news was noisy - clacking wire service machines and metal typewriters. Today the environment is different but the students are the same: motivated, creative, nimble, and smart." "Serving as an adjunct faculty member allows me to follow in the traditions of the dedicated faculty mentors I had throughout my time at AU. Seeing my students develop and grow through the course of a semester and beyond brings with it an indescribable joy, for being able to have a tangible impact on their lives, careers, and world view. I'm truly grateful for being given the privilege and honor to serve as a faculty member at AU." "It's an amazing feeling to walk across campus and talk with faculty who helped develop my career as well as provide guidance and inspiration." "The thing I like most about working at the place where I received my graduate degree is to be back on campus interacting with such bright, talented, and engaged students, faculty, staff, and alumni, plus seeing the continued changes at AU over the years, making it as great of a learning environment as it's ever been - under the leadership of a fellow AU alumnus!" "Knowing the quirks of the AU student body makes my job in Alumni Relations a lot more fun! I love being able to talk to older alumni about their time on campus and the great changes that are happening to the community." 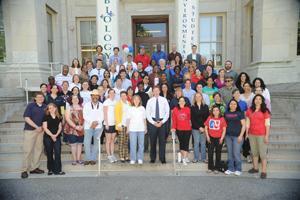 Are you a current faculty or staff alumnus or alumna? Don't forget to join us for All-American Weekend's Faculty and Staff Alumni Bagel Breakfast on Friday, October 18 from 9:30 - 11:00 a.m. in Mary Graydon Center 247. You'll enjoy bagels, coffee, and free AU goodies. To register or for more information about other All-American Weekend events, visit alumniassociation.american.edu/aaw. We hope to see you there!